Hey guys! 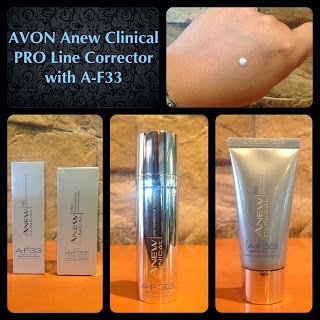 Around the same time last year I found my holy grail in skin care, Avon Anew Clinical PRO Line Corrector Treatment with Amino Fill 33 (A-F33). I was so impressed with how it effectively improved my skin condition like no other product I've tried before. I only intended to get the Avon Anew Clinical PRO Line Corrector Treatment (L) but Avon threw in the Anew Clinical PRO Line Corrector Hydrating Cream (R) for free! I'll be talking more about the cream since I already made a thorough review on the serum last time. My initial experience with this wonder product was when I got a 28-day trial kit after registering online. The overall effect on my skin was pretty much amazing but I still wanted to explore other products so it took me a while to purchase the full size. The treatment serum is housed in a silver flask with a pump dispenser which is far better than the trial kit's multiple sachets. I love the narrow nozzle for dispensing just the right amount of product. This serum is milky white and has the consistency of a runny lotion. It has a faint chemical scent that doesn't linger and it doesn't sting or cause any adverse skin reactions. My face had minimal peeling while my neck was peeling visibly after using this for a week. After 4 weeks of religiously applying this serum on my face and neck, my overall skin condition noticeably improved. I can't specifically point out its effect on fine wrinkles but I'm more pleased with the way my skin became smoother, look healthier and even toned. This cream completes the A-F 33 line and I was fortunate enough to get it for free along with purchasing the serum. It comes in a squeeze type tube with a cap, quite simple and generic for a skin care product. Good thing I got this for free or else I would've really been disappointed about the packaging. Like the serum this cream also appears milky white but a bit thinner. It has that signature chemical scent that goes off almost instantly. It applies smoothly on your skin without stinging or causing any adverse reactions. A pea size is all you need to cover your entire face and another for your neck. It effectively moisturizes your skin without looking or feeling greasy. I love that I wake up to smooth and supple skin each morning. A friend once told me that Avon products are underrated and overlooked. After having tested the Avon Anew Clinical PRO Line Corrector Treatment and Hydrating Cream, I'm going to have to strongly agree with her. Who would've thought I'll find an effective product from Avon most especially a holy grail? Overall, the Anew Clinical PRO Line Corrector Treatment and Hydrating Cream are my all time favorites from Avon. I will continue using these and strongly suggest you to try them too. The tag might be a little intimidating but Avon gives great promos all the time so you might want to watch out for that and avail of them at discounted prices. I got both products for only 999 Php instead of the accumulated value of 3,498 Php. Seriously that's more than 70% worth of discount. Any thoughts on Avon products? Feel free to share them on the comments section below. Thanks for reading and have a great weekend!